Rebel Conservative MPs have joined forces with Labour to inflict a fresh blow on Theresa May’s government in a Commons Brexit vote. It means the government will have to come up with revised plans within three days if Mrs May’s EU withdrawal deal is rejected by MPs next week. No 10 said Mrs May’s deal was in the national interest but if MPs disagreed, the government would “respond quickly”. The government was expecting to have 21 days to come up with a “plan B” for Brexit if, as widely expected, Mrs May’s deal is voted down. Among those voting against were 17 Conservatives, including former ministers Justine Greening, Sam Gyimah and Jo Johnson who want to see another referendum to decide whether the UK should leave or not. Former attorney general Dominic Grieve, the Conservative MP who led the rebellion, said he was acting out of a sense of a “deepening crisis” over Brexit. He told the BBC there had been too much “can-kicking” by the government and if the PM lost next week’s vote, she would need to have “serious dialogue” with MPs about alternative options. He said there was no need for the prime minister to go to Brussels to try and improve the deal. “I would rather hope that the government has been focusing on alternatives as it has been pretty clear for three to four months that the PM’s deal is in trouble,” he added. Fellow rebel Sarah Wollaston said she and other MPs opposed to a no-deal exit were engaged in a “guerrilla campaign” to show that it would never get the consent of Parliament. The new Grieve amendment, now passed by MPs, means that in the event the PM loses next week, the Commons will then have a chance to vote on alternative policies – everything from a “managed no-deal” to a further referendum, via a “Norway option” or a reheated version of the current deal, could be on the table. If a majority could be found for anything, it would not have the force of law – but it would at least indicate a policy which had the support of MPs. This is, in short, a massive ruling by the Speaker, made, apparently, against the advice of the Commons Clerk, Sir David Natzler. But Conservative Brexiteer Jacob Rees-Mogg, who favours leaving without a withdrawal agreement, said it would not stop the UK exiting on 29 March. “It merely requires a motion to be tabled not even debated,” he said. And prisons minister Rory Stewart, who backs the PM’s deal, said requiring Mrs May to restart complex negotiations with the EU and come back with changes in three days, was “unreasonable”. He said Mr Grieve was “trying to provide more support for what he wants, which is a second referendum”. Downing Street said it would consider the repercussions of Wednesday’s defeat but its intention had always been to “provide certainty” as soon as possible. Labour has said it will table a motion of no confidence in the government if Mrs May’s deal is voted down. Shadow Brexit secretary Sir Keir Starmer said Parliament had to “take control of what happens next” and suggested delaying the date of the UK’s exit beyond 29 March might be “inevitable”. He warned the UK’s options were narrowing given the need to avoid, at all costs, a no-deal exit which he claimed was “simply not viable for practical reasons”. 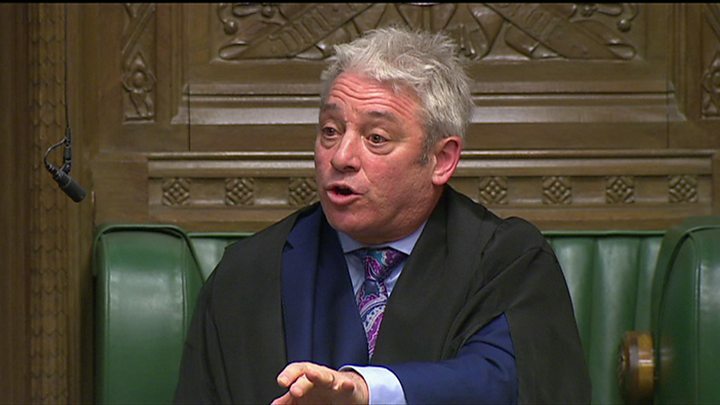 Commons Speaker John Bercow faced an angry backlash from some Conservative MPs over his decision to allow MPs to vote on the issue. The MPs claim Mr Bercow broke Commons rules and ignored the advice of his own clerks. Commons leader Andrea Leadsom was among MPs to challenge his ruling in a series of points of order after Prime Minister’s Questions. They argued that the business motion, tabled by the government, was not amendable and said the Speaker was breaking with precedent. Mr Bercow said he had made an “honest judgement” after consulting his clerks but rejected calls from Ms Leadsom to publish the advice he had received. He insisted he was “not setting himself up against the government but championing the rights of the House of Commons”, adding that if people wanted to vote against the amendment they could. But a number of Tory MPs said the decision cast doubt on Mr Bercow’s impartiality, with Crispin Blunt questioning whether he remained a “neutral referee of our affairs”. The Commons defeat was the second in the space of 24 hours for the government on Brexit. On Tuesday, MPs, headed by former Tory ministers Mr Grieve and Oliver Letwin, defied the government on an amendment aimed at making it more difficult to leave the EU without a deal. 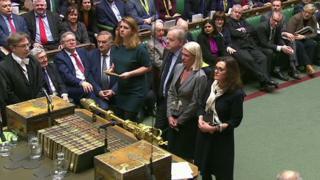 The clashes in the Commons came as the PM, who cancelled a vote on her deal last month at the last minute to avoid a humiliating defeat, launched a fresh push to convince MPs. She is hoping new proposals on Northern Ireland will change enough MPs’ minds to save the deal. Under the plans, the Northern Ireland Assembly would have a say on new EU rules if the backstop plan to prevent physical checks on the Irish border comes into force after Brexit. But the Democratic Unionist Party, on whom Theresa May relies for her Commons majority, have already rejected the so-called “Stormont lock” plans as “cosmetic” and “meaningless”. Ministers have also accepted calls for MPs to be able to vote next year on alternatives to activating the backstop, such as extending the proposed 21-month transition period.